Last year I wrote about Kimanis RM1.5billion gas-fired power plant in the district of Papar. On his busy schedule to get himself up-to-speed with the goings-on in the power supply issues in Sabah, Minister Dr Maximus Ongkili gave us a hint of when we will have better and more stable power supply in this part of the country. Dr. Maximus (wearing hat) says that will happen in March next year. 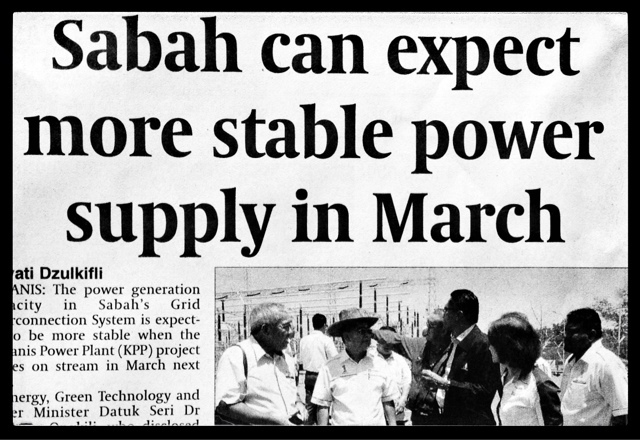 The power generation capacity in Sabah's grid is expected to be more stable when the Kimanis Power Plant (KPP) project comes on stream next year. 300MW of electricity is expected to be generated in stages beginning the first quarter of 2014. The power plant consists of 3 generating blocks and each block generates 100MW of power. So far the completion of works has reach about 96%. "Completion of delivery on the Kimanis Power Plant is by end of this year but the first 100MW will be channeled in March next year and the other two blocks with about 200MW will be generated in July as the deadline." - Datuk Seri Dr. Maximus Ongkili, Minister of Energy, Green Technology and Water. I suppose the reporter is trying to say that the installation works at KPP is scheduled for completion at year-end but due to some technical issues that need to be addressed, the first 100MW will only be channeled in March next year. Last year, SAIDI target for Sabah was 490 minutes per consumer for which SESB said was achieved. This year SESB targetted 450 minutes of downtime per consumer, and I feel that a modest 40-minute improvement is very marginal. But with the completion and operation of the Kimanis Power Pant next year, the utility company is expecting to achieve SAIDI of below 300 minutes per customer. I suspect transmission lines will not be up to mark to take the new power generated. A lot still need to be done on the power supply infrastructure. A lot has also been promised to rectify the situation.